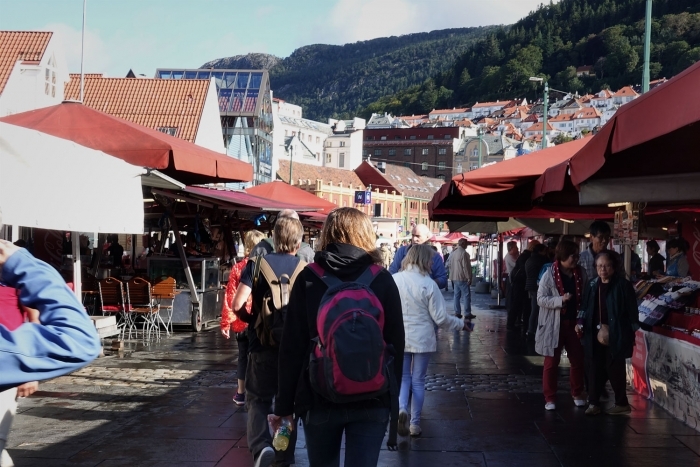 We arrived quite late into Bergen on a Sunday night, having travelled from Oslo over the past two days via Flåm and then Hardangerfjord, essentially doing the Norway in Nutshell and the Hardangerfjord in a Nutshell tours DIY. We got off the train just after 9pm and headed for our accommodation. We had decided to stay in an airbnb which was quite close to the centre and turned out to be very well equipped and clean for a reasonable price given Norway's general expensive-ness. After dropping our stuff off, we went out for a little explore and to get something to eat. 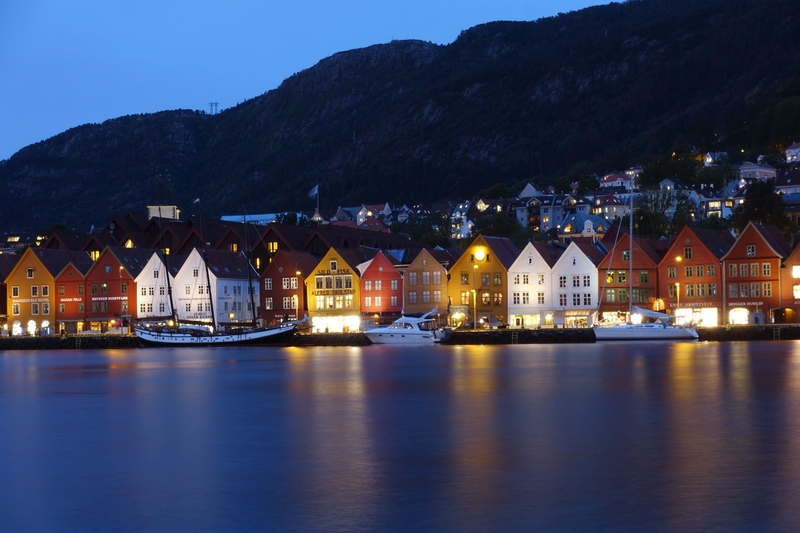 Our first stop had to be the famous Bryggen - Alistair was keen to try and get a nighttime photo of the area and with the sun just having set, it was perfect conditions to get some dusk pictures. It was exactly what I had expected from seeing the pictures - we didn't actually go across to have a look around, we kept that activity for the next day but admired it from across the harbour. Given that it was quite late by that time, we had a quick google to try and find somewhere still serving food on a Sunday night. 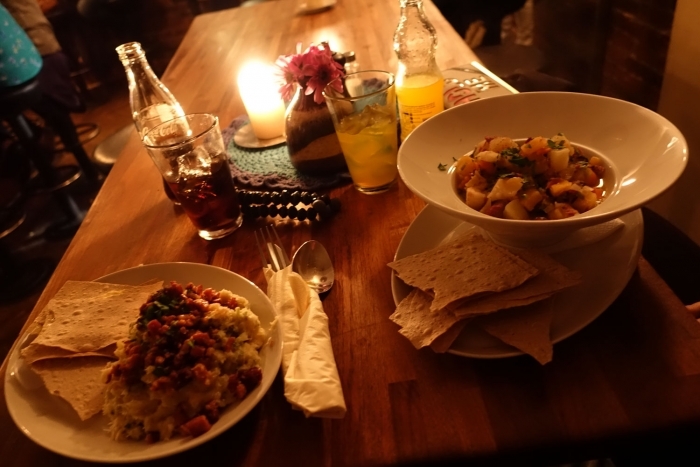 We came across a really well reviewed bar called Pingvinen (which is Penguin in English) and got some late night food there which turned out to be awesome - so tasty and wholesome, I would heartily recommend! Then it was home to collapse into a comfortable bed before heading out the next day for some more exploiring. 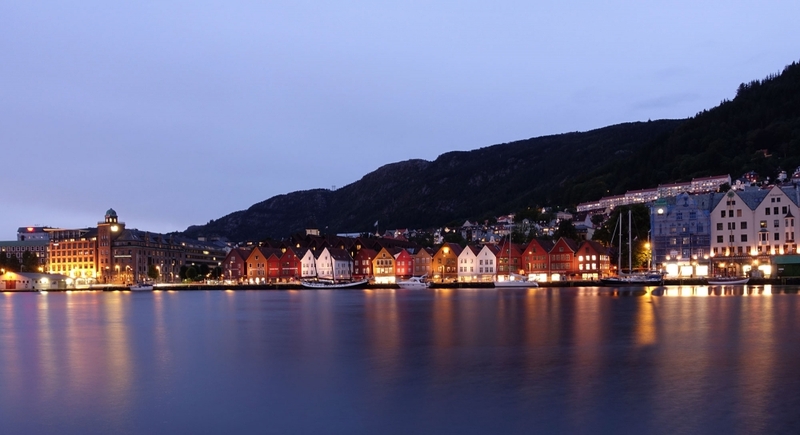 Our flight was at 6pm so there was plenty of time to have a good look around Bergen the next day. 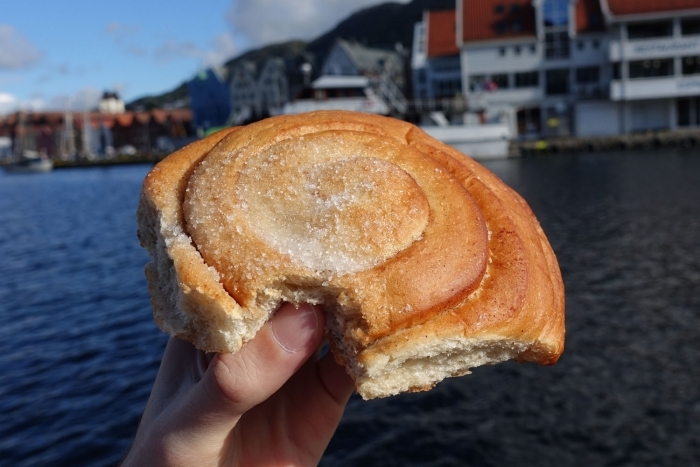 For breakfast we grabbed one of the Norwegian cinnamon rolls called Skillingsboller from Godt Brød and went down to the waterfront to eat it. Then we spent some time actually wandering through the Bryggen area itself - which is actually pretty cool, there are lots of little craft type shops and so many little winding alleys to go up and down and explore. We had been umm-ing and ahh-ing about whether or not to make the climb up to the viewpoint on Mount Floyen. We didn't have enough tme to do any of the other hikes in the area so this was the only one available to us. There had been a quite heavy rainstorm but when this cleared, it was turning into a lovely day so we decided to go for it. All in all it took us about an hour to walk up (this includes lot of stops as we were carrying all of our stuff with us having checked out of the accommodation in the morning). It is quite steep but definitely manageable if you are reasonably fit and if I can do it then the majority of people definitely can! 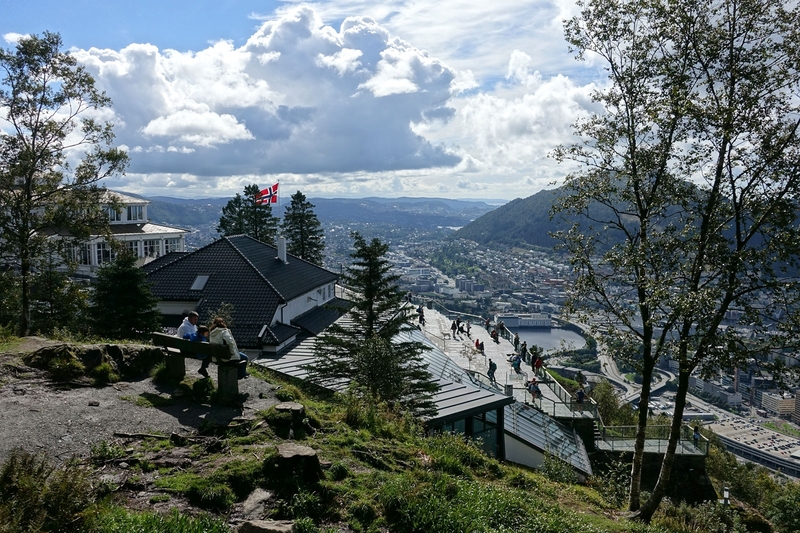 It was a really nice walk and the view at the top over Bergen turned out to the lovely given that the weather had cleared up. If you don't fancy the walk then you can also pay to ride the funicular railway up to the viewpoint, or just back down again. We decided to walk back down a slightly different route to the one we came up considering the sun was out and shining and we were in no rush. 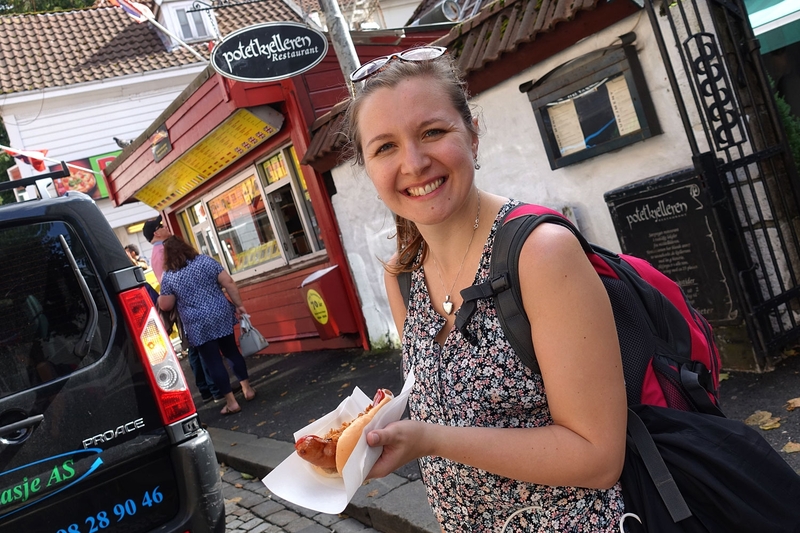 At the bottom we grabbed a hot dog for lunch from Trekroneron near the harbour, which sells unusual type hot dogs - Alistair got a reindeer hot dog which was a bit different and I just had a standard frankfurter. We didn't have long after this before we had to get our bus to the airport so we just went for a quick look at the shopping area but weren't really in the mood for buying anything so grabbed an ice cream and sat in the sun whilst waiting for our bus. We got the airport bus from outside the Radisson Blu at Bryggen which goes straight to the airport (Flybussen). They run every 20 minutes and you can buy your ticket online beforehand if you want (which is what we did) and helpfully the ticket allows you to get any bus on that specific date so if you miss a bus then you can just get on the next one.